I met some friends for lunch at Claim Jumper a couple of years ago right in the middle of Whole30 January. This obviously limited my menu options but Salmon Oscar jumped out at me almost immediately! I double checked to make sure the sauce was dairy-free, which it was, and decided to give it a try….. When I got home I wanted to recreate the meal immediately, but somehow ended up posting Steak Oscar instead. 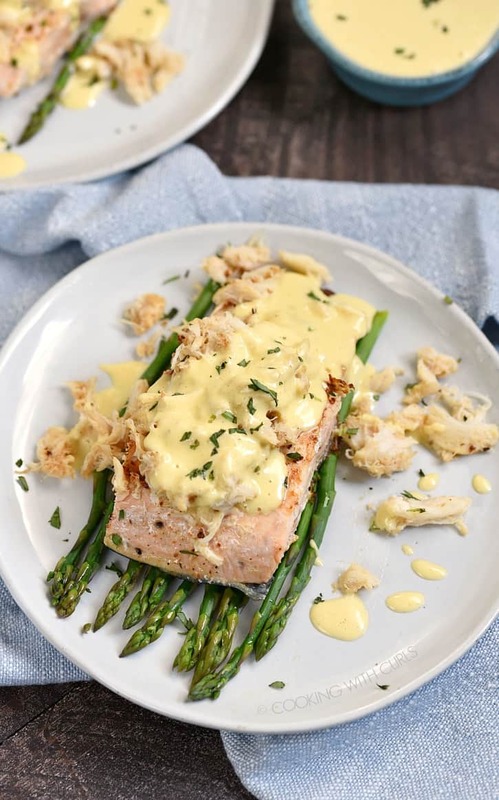 Oh look, a butterfly…..
Salmon Oscar is grilled salmon topped with lump crab meat, sitting on a bed of asparagus and drizzled with Béarnaise sauce! How amazing does that sound? Don’t freak out, it is relatively simple to prepare and guaranteed to impress! 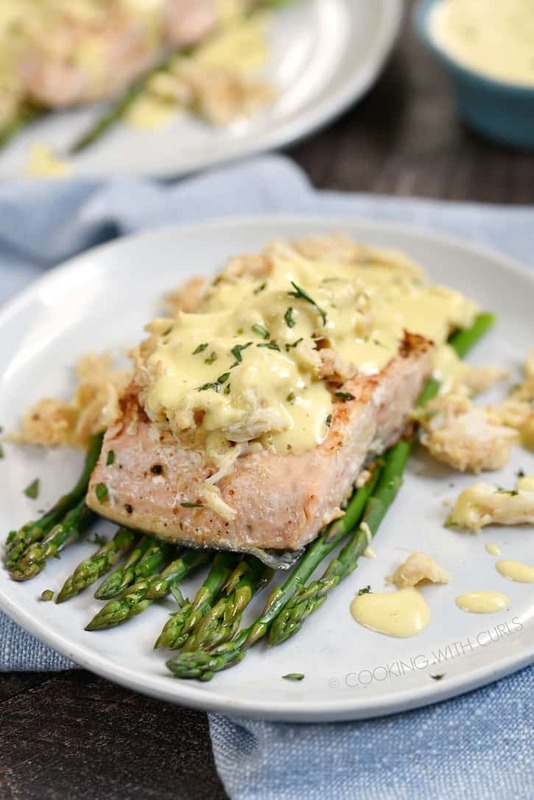 Make your Easy Blender Béarnaise Sauce and set it aside. 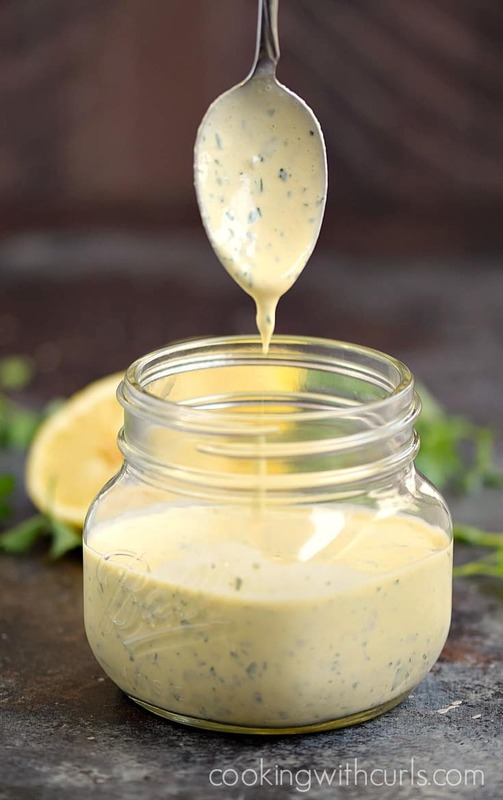 I kept this a separate post for those who have never made Béarnaise sauce before, and because it makes more than you need for two servings. 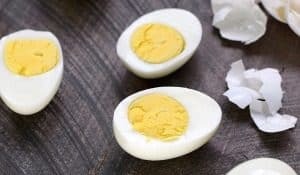 You could actually make it a day ahead and keep it refrigerated until ready to use….just don’t tell the French that I said that. Heat the butter and olive oil in a cast iron skillet over medium-high heat. 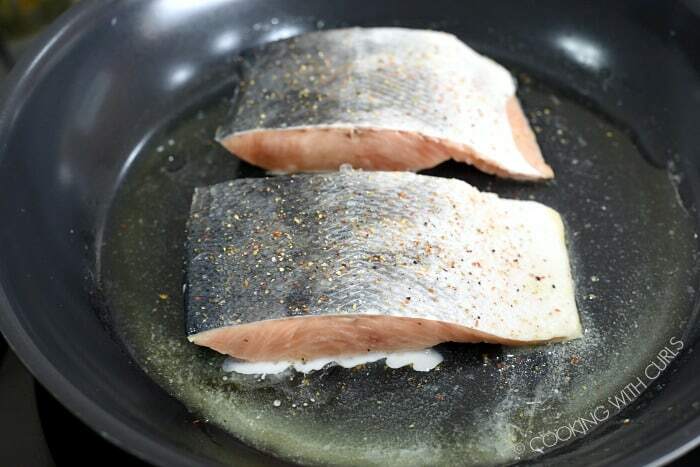 Season both sides of the salmon filets with garlic pepper, then place in the hot skillet. Cook skin side up for 4 to 5 minutes, flip over and cook for an additional 4 to 5 minutes until salmon is cooked through. If using a thermometer, cook until center reaches 135 degrees. 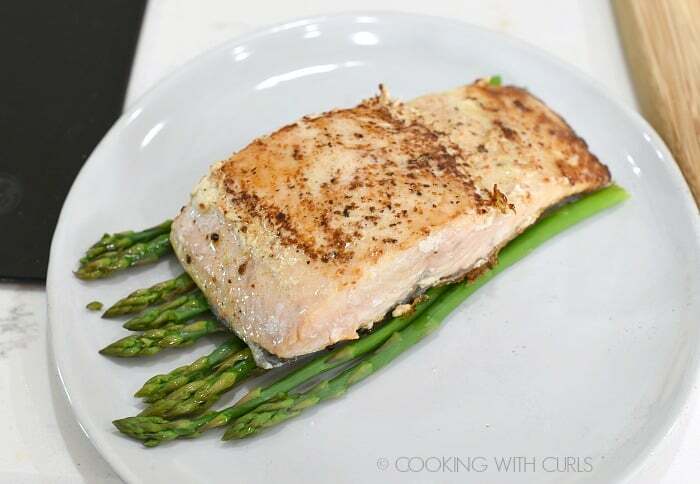 Divide steamed asparagus between two plates and top with the grilled salmon. 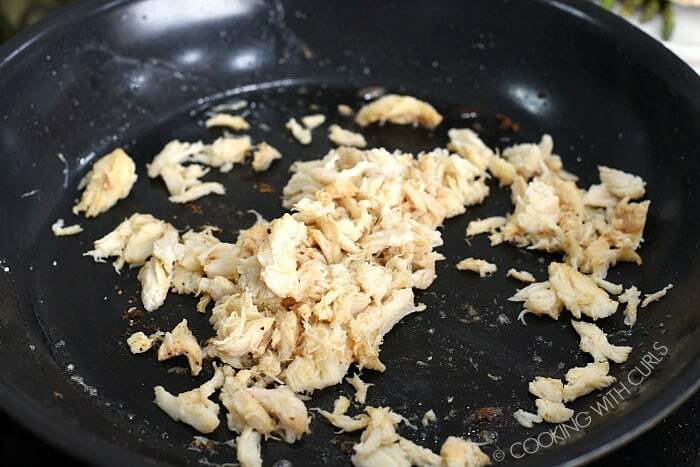 Remove excess oil from the skillet and add the crab meat. Cook for one to two minutes until the crab is heated through. 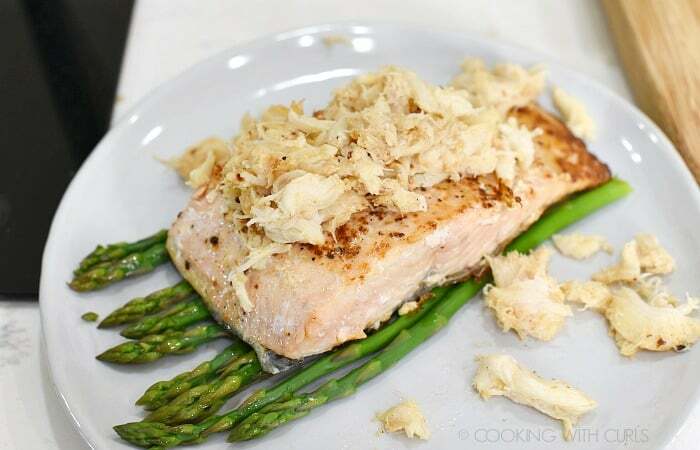 Divide the crab meat over the salmon. Drizzle with sauce, sprinkle with tarragon and serve. 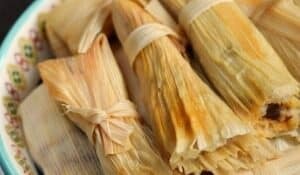 Even your pickiest friends and family members that claim to hate “fish” will love this meal, it is amazing!! A non-stick skillet was used to prepare this meal. The amount of asparagus used is just a suggestion, serve as much as you like. I have actually made the Béarnaise sauce ahead of time and reheated it in the microwave before serving. Heat it in 30 second intervals, stirring in between until heated through. 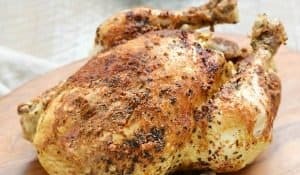 This meal can easily be doubled or tripled to feed the entire family. I used canned lump crab meat because $4.99 for a 6 ounce can was much more reasonable than $17.99 for 8 ounces of fresh…no brainer! 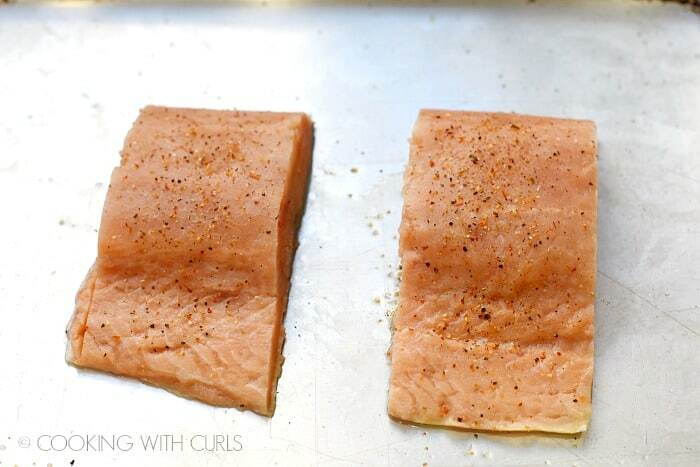 Skin-on salmon is the only way that I can purchase wild-caught salmon. I never, ever use farm-raised! Too many chemicals and dyes. For an easy way to prepare asparagus, check out this Instant Pot Steamed Asparagus post. Because my asparagus was soooo skinny, I steamed it for “0” minutes and it turned out perfectly. 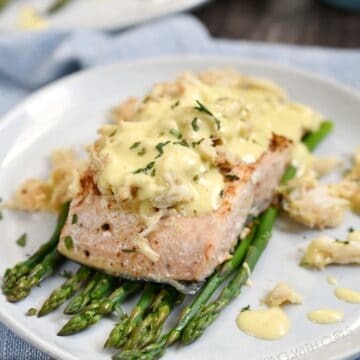 This classic Salmon Oscar pairs salmon with lump crab, asparagus and a rich Bernaise sauce for an out of this world meal that is simple to prepare!